Things have been quiet over here. Our ice cream making has been on hiatus this summer as we packed and moved into a new apartment (with a bigger kitchen and plenty of freezer space in the basement!). While we have not been making ice cream, we have indulged in some frozen delights, which inspired the flavor we made recently. 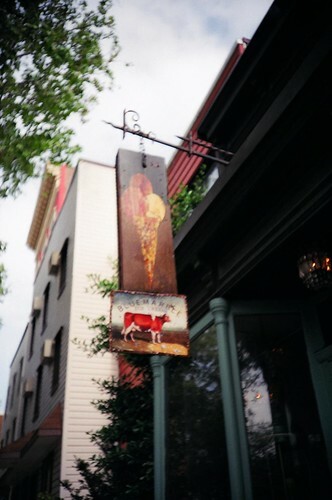 Old Blue Marble sign in Williamsburg, Brooklyn. Everyone’s favorite summer treat comes to the forefront at this month’s MSG. Sarah Lohman of Four Pounds Flour will unearth the stories behind our favorite ice cream treats and share some of history’s wildest bygone flavors—that may be due for a revival. By the end of the night, you’ll be able to answer questions like: which came first, chocolate or vanilla? The ice cream sandwich or the ice cream cone? Neapolitan or liquid nitrogen? As always, MSG is free and takes place at Public Assembly (70 North 6th Street) in Williamsburg. Doors open at 7pm, with samples and drink specials all night long. Tom was born in Youngstown, Ohio and he remembers family trips to Dairy Queen and Scooper’s in Canfield. Those places bring to mind memories of chocolate milk shakes and scoops of butter pecan from Dairy Queen (yes, they had scoops back then) and the black cherry rum from the now defunct Scooper’s. A more seldom treat was ice cream from Handel’s Ice Cream and those occasions typically ran parallel with little league baseball. 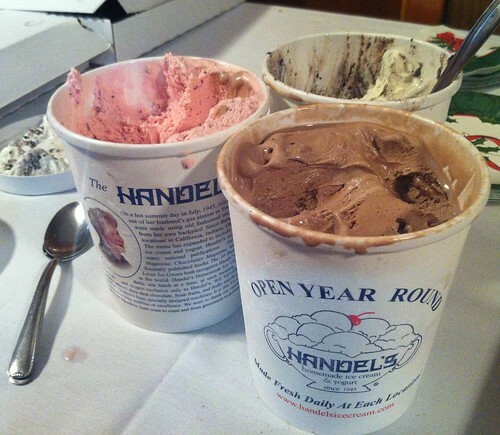 Now when Tom returns to Ohio, Handel’s Homemade Ice Cream & Yogurt is the only choice. 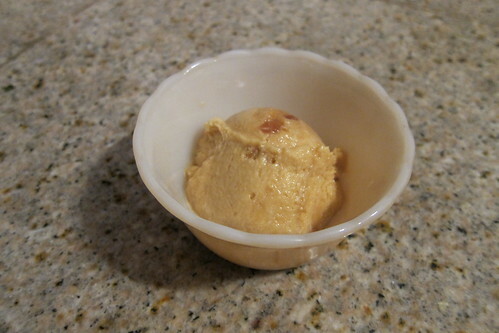 He does not even have to travel to the scoop shop to get it…his family brings it to almost every family function. Handel’s Homemade Ice Cream is now a franchise with locations in six states (if you live in Ohio they are all over). But Handel’s truly is a Youngstown establishment with its original location on the South Side of Youngstown (their headquarters is still in the suburb of Canfield). The Euphoria- Lock: Is Your Pint Safe? 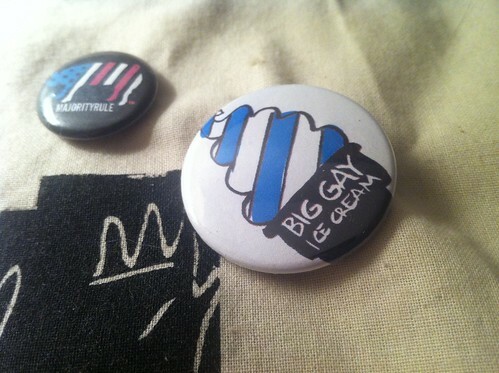 Ben & Jerry’s Euphoria-Lock via aspiringauteur / brain-food. To most people ice cream is not a big deal, but others will defend the frozen treat with their life. Ben & Jerry’s has come up with what appears to be a simple solution: the Euphoria Pint-Lock. This is a plastic three digit pad lock that protects your precious pint from roommates and children that might be scheming to eat all of your delicious ice cream in the middle of the night. We remember ice cream cakes from growing up in the 1980s. Tom’s family got birthday cakes from Dairy Queen, but Kira and her father got Carvel chocolate ice cream cakes from the Publix freezer on their shared birthday. It has been a long time since either of us enjoyed a proper slice of ice cream cake. 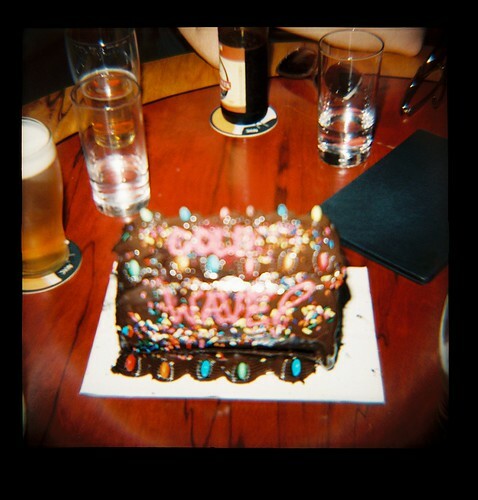 Brady got Tom a “Cold Wave” ice cream log from Baskin Robbins for his birthday last year. It’s not really cake shaped, but comes pretty close. Last week at Allswell in Williamsburg they had a black mint chocolate ice cream cake on the menu. Of course we had to try it. The history of the ice cream sandwich is a little bit foggy, but many signs point to it being an American food. In 1900 a man on the Lower East Side was said to have sold quarter-inch slabs of ice cream between two water wafers. Pictures from the Jersey Shore in 1905 show a horse-drawn cart selling ice cream sandwiches for one cent, and one of the first appearances of the modern ice cream sandwich was at Forbes Field, in the Oakland neighborhood of Pittsburgh. The New York Times even mentions the food as early as 1928. The ice cream sandwich spawned many frozen treats including the Eskimo Pie, originally called the I-Scream-Bar, and I was unable to find an instance of the ice cream sandwich being eaten in the world before its United States debut. The town of Blue Earth, in Minnesota, claims to be the birthplace of the ice cream sandwich, but fails to back up their claim to fame. Michael’s first ice cream sandwich ever from Melt Bakery. Last summer was when we realized that the ice cream sandwich might actually be something truly American. Michael, founder and creative director of Hong Kong Honey, was visiting New York working with our good friends at Brooklyn Homesteader. We all headed down to Parked! Food Truck Fest for some delicious treats and our excursion ended by sharing a couple of ice cream sandwiches from Melt Bakery. One was a chocolate concoction, and other was the inspired combination of ginger ice cream with lemon sable cookies. Michael mentioned that he had never had an ice cream sandwich before, and we talked about how truly American the food was. He was surprised when he opened the package when it revealed cookies on the outside instead of bread.